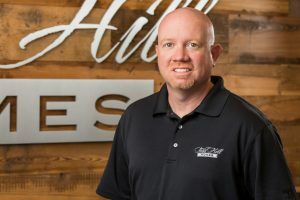 Growing up in Stilwell, Kansas and gaining 20 years of experience in the residential construction industry, Todd Hill has made a name for himself as one of Johnson County’s premier home builders. Honesty, attention to detail, open communication and the willingness to adapt for his clients are just a few of the many attributes that set Todd apart from other builders. With his eye on building new homes for as long as he can remember, Todd began working for a large residential construction company that specialized in installing infrastructure. At age 21, Todd started his own construction company. Through hard work and dedication, he developed a successful business and strong relationships with some of the best and most well-respected residential developers in the area. Soon after, Todd advanced to managing some of the area’s top communities. Working side by side with developers and other home builders, he quickly realized that his lifelong dream was within reach and began building custom homes of his own. With the support of his wife, Kelly, and three beautiful daughters, Todd realizes that he is very fortunate to have the opportunity to do what he has always dreamed of doing, and it shows with the passion he puts into every home. Raised in a family of six in Johnson County and now raising a family of his own in the same area, Todd stays in touch with the way families live and how they want their home to fit their growing needs. Whether you want to modify one of his existing house plans or start from scratch with an architect, Todd Hill promises to exceed your expectations to deliver you the dream home you deserve.